Other townhall meetings and public addresses highlight her indifference to a wide variety of other problems as well. For example, how does she intend to solve the threat of a dwindling salmon population? Has SHE met with fishermen, processing facilities and tribal leaders to determine a correct course of action? No. But the incumbent did. And the bill Jaime spearheaded to manage local predators applauded by local businesses, consumers and sportsmen which draws from the knowledge and experience of her constituents won’t have much value if it is not implemented. It would be nice if she were willing to give us a straight answer on these things, but apparently we aren’t worth it. Nor, can we get answers to the tough questions on her campaign website. The one thing Long like to talk about is the failures and deficiencies of other elected officials, her opponent JHB receiving the sealion’s share, to reference where all our salmon are going. Criticizing the incumbent’s failures is one thing, but her scandalous and downright ugly remarks towards a popular elected official is an insult to a great representative AND the people who chose her. When she alienates the very people she needs to vote for her and fails to win our confidence, who exactly is it that she can rely on for support? A few decrepit labor unions that do not properly represent their members and a small faction of radical environmentalists and Bernie-esque socialist cranks. And her favorite glowing endorsement from a former unpopular and ineffective US President. How ironic that someone famous for promising hope and change but delivering a lackluster performance would want to empower her. 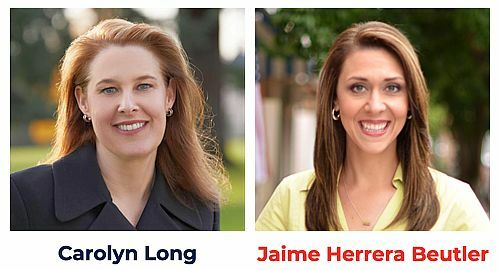 Southwest Washington needs and deserves a representative who will fight for us and be our voice. We need a person of integrity and resolve; someone who takes action, not empty words and propaganda. That person is Jaime Herrera Beutler. Long also has the unqualified support of Rep. Earl Blumenauer. That’s all one needs to know. That dimwitted individual fully supports tolling Washington commuters – and doesn’t give one whit that we are already paying income taxes to Oregon. He was asked point blank if he would support requiring income tax revenue (paid by Washington commuters working in Oregon) be credited to a ‘commuter bank’ of some kind then disbursed to Washington commuters accordingly. For example, if a Washington resident paid $2000 in taxes to Oregon in 2020, and over the same year their commuting fees were $2500, should Oregon be required to refund $2000 to the commuter, thus reducing their commuting fees to $500? Oregon would still get the $2000. They would not get the $2000 in taxes plus another $2000 in fees, but would still get a combined amount of $2500. He categorically rejected such a scenario, basically saying ‘tough luck’.